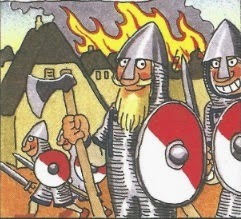 On their way back to the Loire viking camp, Bjorn Ironside and Hastein stopped in North Africa where they bought some African slaves (which was known to the Vikings as 'blaamenn', meaning blue men, possibly West Africans or Tuaregs), they were later sold in Ireland at the local slave market. Bjorn Ironside and Hastein were attacked just when they had passed the Straits of Gibraltar, a Muslim navy from Al-Andalus were waiting for them. In the desperate battle that followed, Bjorn Ironside lost 40 ships, largely to a form of Greek fire launched from the attacking Saracens catapults. The last raid was against Pamplona, and 20 ship, the remainder of the fleet managed to return to Scandinavia.